If you plan on selling your Fort Collins home or you’re looking for ways to improve your home’s curb appeal, there are many landscaping techniques you can use to spruce up your yard. At Advanced Landscaping & Sprinklers, we’ve helped hundreds of Northern Colorado homeowners improve the aesthetics of their yard through customized landscape installation services. In this blog, we’ll look at a few ways you can improve your home’s curb appeal so you can have the yard and landscape you’ve always dreamed of. If you need landscape installation, renovation or maintenance services, be sure to reach out to the professionals at Advanced Landscaping & Sprinklers today! If you’re wondering where to start with a landscape transformation, look no further than your front yard. The front yard of your property can say a lot about your home, and when you hire a professional landscaping company to help install beautiful flowers, trees, and bushes, it can do wonders for your home’s curb appeal. Many landscapers will add customized edging around flower gardens, the house foundation, and even sidewalks and driveways. When you make a point to install edging in curves rather than straight lines around your yard, it adds a unique touch of appeal and character to your property. It’s important to remember that edging is permanent, so it will enhance your landscape and yard all year long. While many Colorado homeowners choose to use native plants in their yard for less upkeep, it can be beneficial to incorporate a diverse array of plants for your front or back yard. When you choose flowers and plants that bloom during different times of the year, it will keep your landscape attractive all year long. If you want to make a statement with your lawn, why not incorporate some large decorative rocks into your landscape design? This is a great way to break up the monotony of a large lawn, and if you want to take your design even further you can consider adding uplighting to the different rocks around your yard. When it comes to planting flowers and bushes around your home, it’s always a good idea to start planting them around the foundation of your property. Low-grading shrubs or groundcover should be planted in front of your low windows and any porches. Larger rounded shrubs or small trees are a great solution when planted on the corners of your home. These larger plants will help to frame your house and soften up the box-like structure it embodies. 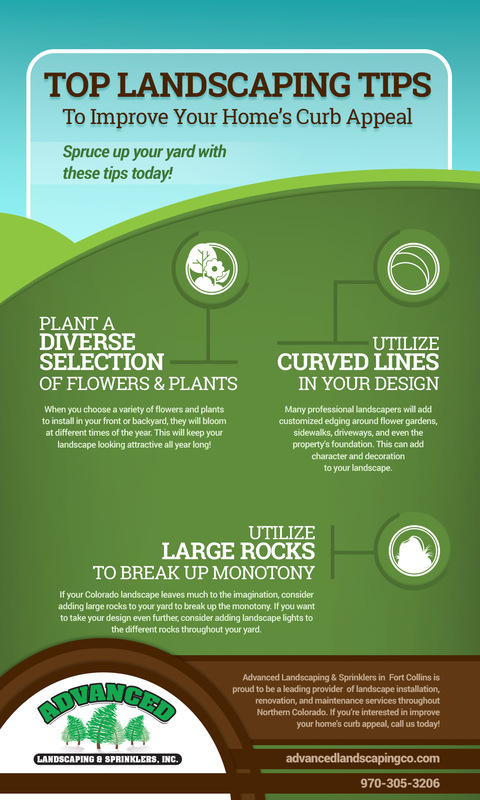 As you can see, there are many ways you can improve the curb appeal of your lawn and landscape. If you live in Northern Colorado and you’re looking for a professional landscape company to help create a custom landscape design for your home, contact Advanced Landscaping & Sprinklers today! We also offer irrigation repairs, sprinkler blowouts, commercial mowing, and more!